A frilled dragon is best kept in a large wooden vivarium. 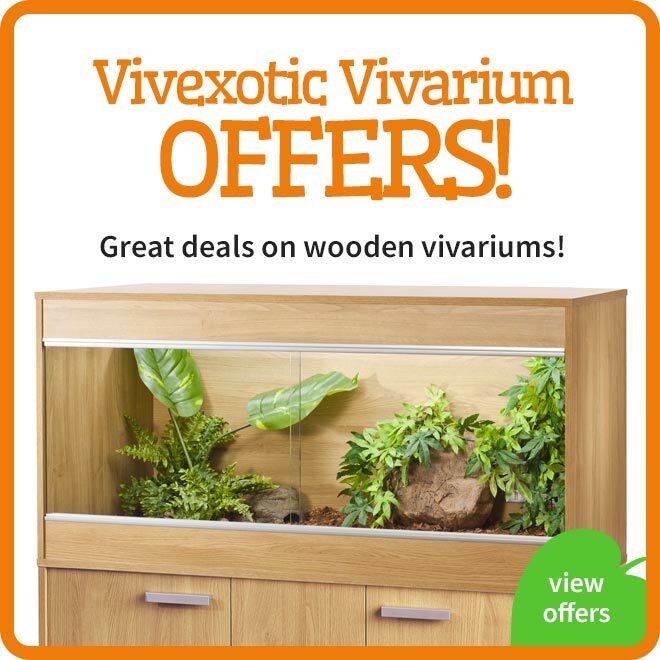 This is because wood is an excellent insulator of heat and so a wooden vivarium will make it easier to control the crucial temperatures required inside the habitat. Other enclosures such as glass terrariums are far too efficient at releasing heat making it difficult to get up to temperature and keep this temperature consistent throughout the year. 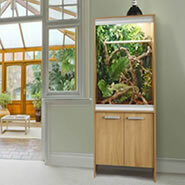 The wooden vivarium should have good ventilation to help remove humidity and replenish the air in the enclosure. 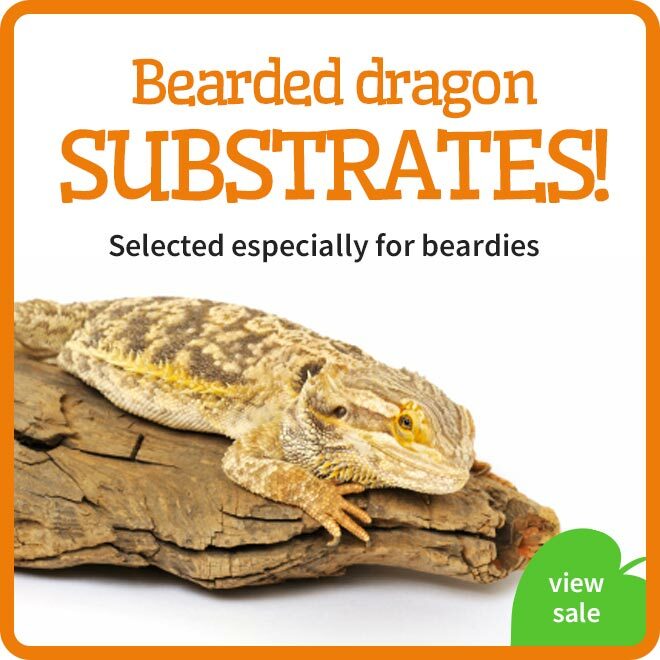 The dragons vivarium should be at least 1150mm (46") in length and 915mm (36") tall. 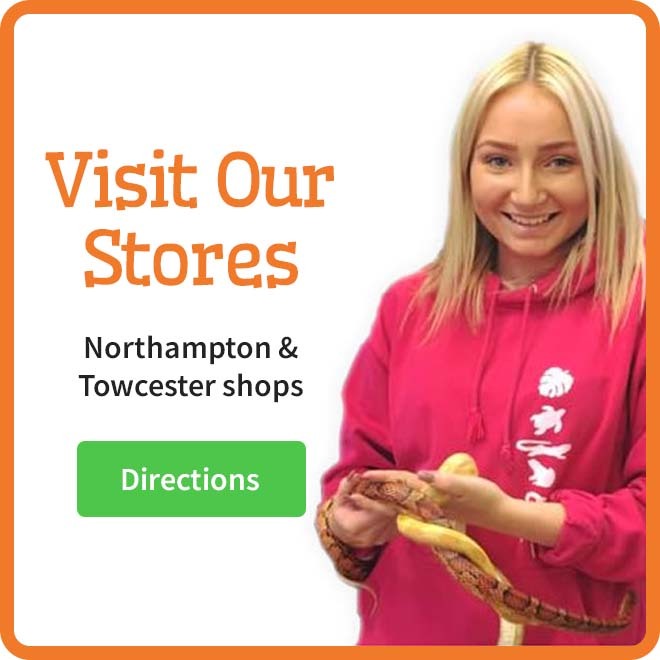 There are 2 main reasons for this; firstly frilled dragons are not small lizards and can easily grow to 450mm in length. They require a proportionate amount of space to live happily. Secondly, the vivarium needs to have a sufficient length to allow for the creation of a temperature gradient. The enclosure needs to be intensely hot at one end, but have enough distance for the temperature to drop at the cool end. With dragons height is another factor, these animals can be very active and do like to spend a lot of time off of the ground. During the day, frilled dragons require a very hot basking temperature. This is achieved by using clear spot bulbs at one end of the vivarium. 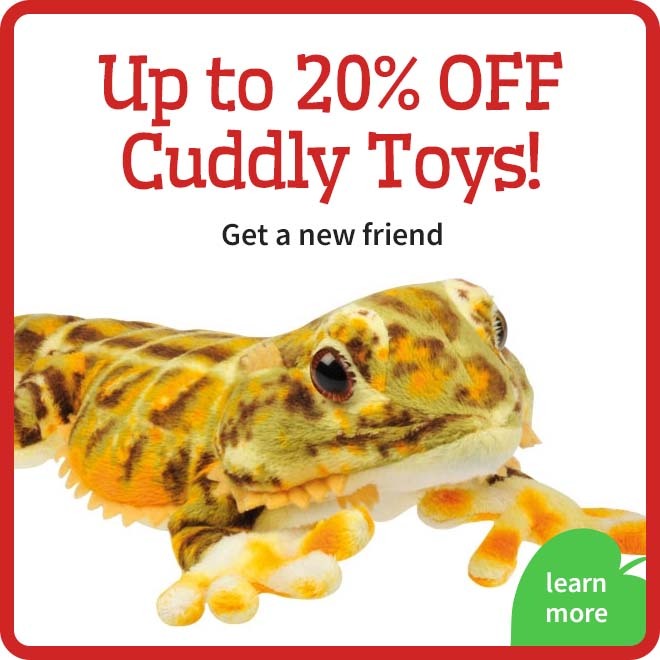 To accomplish the required basking temperature of 100oF we use 2x basking bulbs (60w in a large Vivexotic vivarium). A narrower basking area can be achieved by using one higher wattage bulb instead. Basking bulbs should be on for 10- 12 hours per day. At night frilled dragons require a drop in temperature and darkness. The basking lights should be switched off. 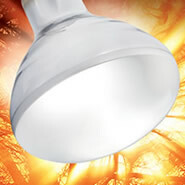 A night time temperature of 80oF is created by using a ceramic night bulb. These radiate heat but produce no light. This bulb should be protected with a ceramic bulb guard and controlled by a good quality thermostat. 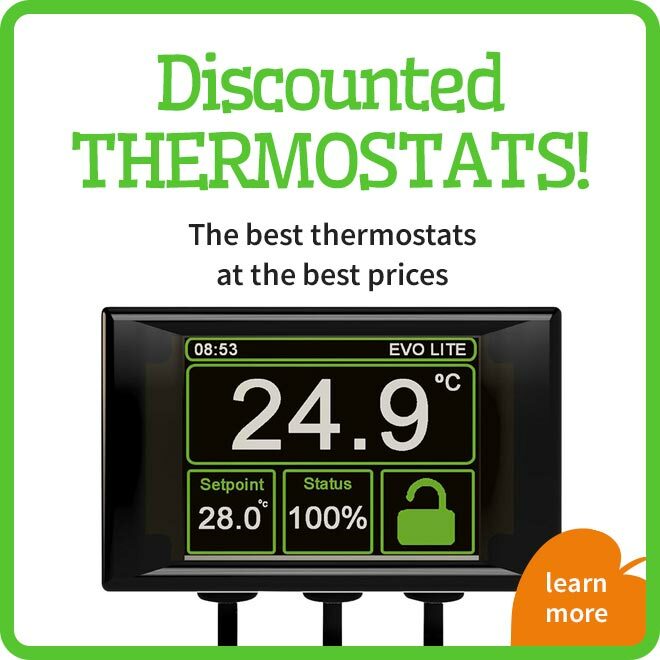 The thermostat will automatically turn on the ceramic heat bulb at night when the temperature in the vivarium drops. Temperatures should be monitored daily using a thermometer. Frilled dragons are from intense UV regions. Animals that actively bask in hot climates naturally receive a high dose of UVB from the sun. Their UVB tube should reflect that. 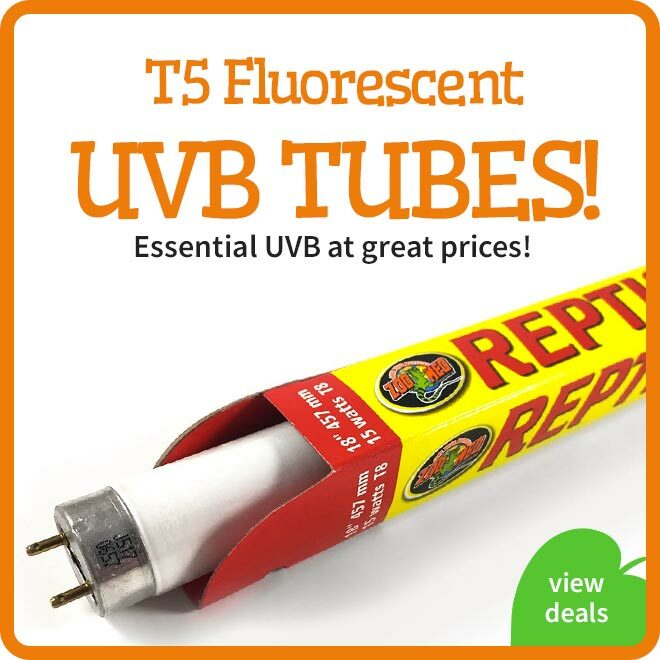 A fluorescent UVB tube should be used inside the vivarium with a reflector so no UVB is wasted. The tube should be at least 10% UVB for this species. 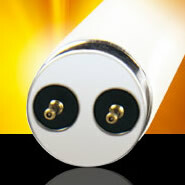 There are 2 different types of fluorescent tube, T8 and T5. T5 tubes are the new technology providing double the range (24'') and lasting twice as long (12 months) so if possible we would recommend the upgrade. These lizards require UVB in order to synthesise vitamin D3 inside their skin. The vitamin D3 helps the dragon to absorb calcium which crucial for bone structure and growth. Without the UVB the dragon may not be able to use the calcium in it's diet. Frilled dragons should be kept on a slightly moist substrate to increase the humidity inside the vivarium. Whilst any loose substrate has the potential to be accidentally swallowed, we have found this to not be a problem with coarse orchid bark and that is what we keep our dragons on. It is also very easy to clean. Frilled dragons are partially an arboreal lizard, they do like to climb on top of things to survey their surroundings. 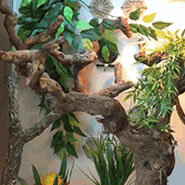 The vivarium should be decorated with various pieces of wood or rock to enable them to do this. The dragon's vivarium can be decorated with artificial plants for a more natural look. Natural wood ornaments look very effective and also provide further perches for the dragon. 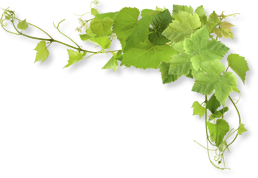 Trailing plants are very good at disguising electrical wires and equipment, as well as providing cover for young lizards. Frilled dragons are insectivores and will mainly eat livefoods like crickets, locust and mealworms. 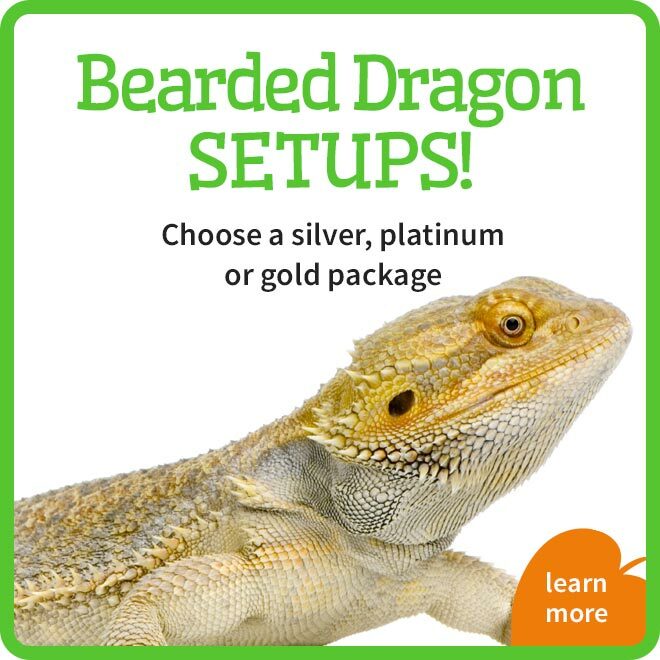 We recommend dusting all livefood with vitamin powder to ensure that the dragon is getting all of the minerals and nutrients it requires. The vivarium should be misted with water every morning to provide hydration and humidity. A water bowl may be used to provide a fresh source of drinking water. 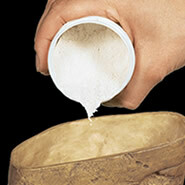 Calcium should be provided daily and dusted directly onto the dragon's food. Vitamins may be added daily for dragons. 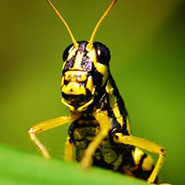 Any livefood should also be 'gut-loaded' with an insect food. 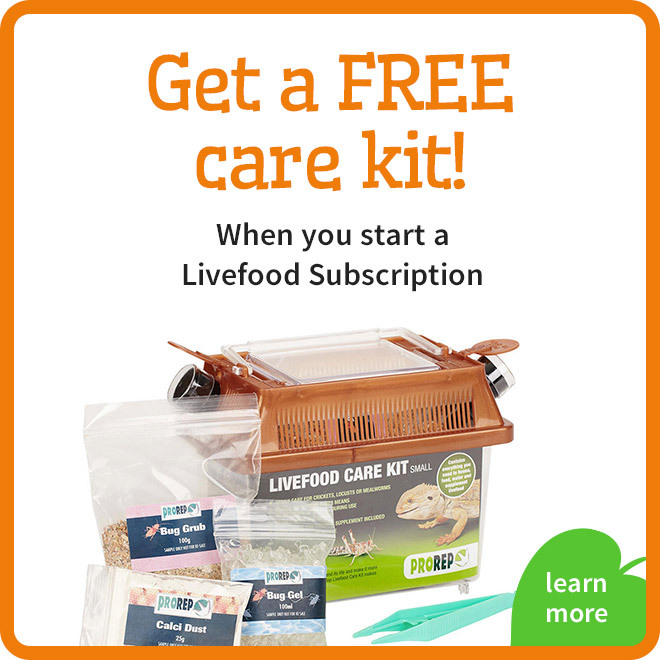 This basically involves feeding the livefood a nutrient rich diet before they are fed to the bearded dragon. 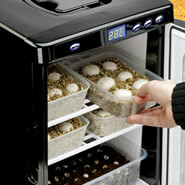 Our livefood is delivered to you already gut-loaded but this should be continued at home.